According to the trendence Graduate Barometer, the German Research Center for Artificial Intelligence is among the 100 best employers in Germany in the field of information technology. The employer ranking is based on the largest career-entry study in Germany, in which more than 50,000 university graduates choose their employer of choice every year. The trendence Graduate Barometer is issued in four series: IT, Business, Engineering and Law. Since 1999, companies have been evaluated annually by students and graduates with regard to their attractiveness, awareness and their own application intentions. According to the study, IT professionals have a great need for attractive work tasks and attach particular importance to corporate culture and flexible working hours in their future workplace. In addition, self-fulfillment in their job is an important topic for the majority of respondents. DFKI was one of the initiators of the Software Campus elite development programme launched at the end of 2011 and is committed to training and promoting young managers in the ICT sector. At the DFKI, future IT managers develop their own research ideas and are supervised by academic and industrial partners as part of a mentoring programme. 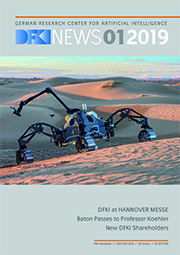 This further improves the permeability between the academic and industry-oriented career path for young professionals at DFKI.